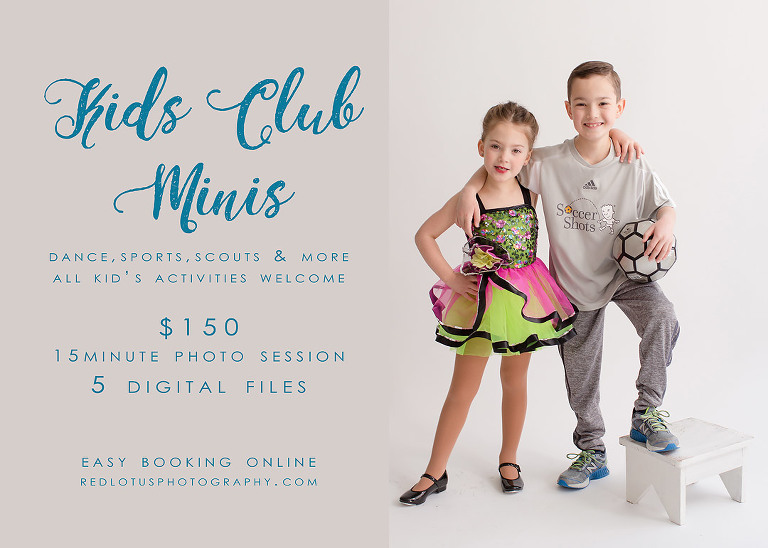 Introducing Kids Club Mini Sessions–Photos for all of your children’s activities in one place. Dance, soccer, hockey, football, girl scouts and boy scouts, and any other activities or hobbies you want to capture. The bonus? You can even photograph your kids together in their respective uniforms/costumes. Scroll down to the Scheduler below to book your session! Q: My child doesn’t belong to any classes or clubs, but does play an instrument; can we still do a Kids Club Mini? A: Yes! These minis are for capturing special photos of your child and any activity, interest, or hobby you like. Q: Will there be any props or special backdrops? A: These photo sessions will be taken on a classic white backdrop with no props; but you are welcome to bring any items you would like to incorporate into your photos! Q: Can we do a family photo during our session? A: Kids Club minis are for kids only, but keep an eye out for holiday minis, which allow for family photos. I personally recommend going for the full custom photo session for your family – you won’t regret it! Contact me for more information! Red Lotus Photography serves the Pittsburgh and surrounding areas, including Mt. Lebanon, Upper St. Clair, Bridgeville, South Fayette, Chartiers Valley, Collier, Cecil, Houston, Peters Township, McMurray, McDonald, Heidelberg, Cranberry, Wexford, Coraopolis, Moon Twp, Sewickley, Shadyside, Fox Chapel, and Gibsonia.